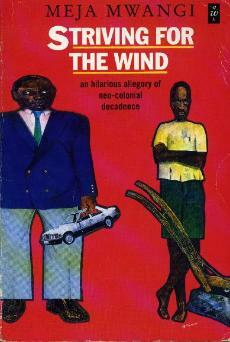 "Striving for the wind" mainly narrates the relationship between Baba Pesa and Baba Baru, who are neighbours. On the one hand, the former is proud and pompous and known to be the father of money. The largest, richest man on his hill and the next and the next. Who is constantly on the look-out for any situation that would tarnish his reputation. Disgracefully enough, he has a well learned son called Juda [name given to him in weird circumstances] who due to his constant drunkenness was popularly labelled as the village drunkard. Juda, whose principles differs from that of his father is fond of haranguing the villagers on the greater values in life. -that a man was truly free and happy only when he had no desire for the things money could buy. It [degree] is not like a third leg... it is not a second head or a different skin.... It is mere piece of paper that says you have read and understood this and that book, and behaved in this and that way. That is all! The mere possession of it does not make you any less or more of a human being than you were in the first place. On the other hand, Baba Baru and his house-hold were poor and humble that they solely depended on their small piece of land as their source of income. Pesa [the rich man], who couldn't stand their state of hopelessness and beggary, was hellbent on keeping them out of sight by requesting to buy their only piece of land. Which, of course they refused to sell him. Furthermore, in my opinion, only few authors can write about so important an issue with the wit and wisdom Mwangi employed. Most chapters made me laugh like a drain while, some others profoundly made me reflect on the human condition. In addition, do not expect to meet a protagonist, all characters herein are important. For instance; Mutiso the goatherd, Baru's teenage daughter, Elijah (Pesa's younger son), the village mad man [specialised in stripping himself naked and running amok in the market square], the new police officer nick-named pass-it-around, Pesa and Baru's respective wives. There is neither rising, nor peak nor fall in the story, I rather felt that each chapter was a sequence of scenes. As a result, I found out that Meja Mwangi is as well involved in the film industry. Yes, I do recommend this novel; as a matter of fact it is a Commonwealth Writers Prize Africa short list. However, keep in mind that the story is set in rural Kenya; therefore, look forward to reading about farming and ploughing. This is my first African Writers Series [aws] of the year, to see more novels I have read from the AWS please click here. "therefore, look forward to reading about farming and ploughing." This made me laugh! LOL..I am as well laughing now.. though it was not my intention in the first place. yeah I am sure you would enjoy it. I do not know if it has an iBook version. I bought a paperback version from Amazon. Lessons from Mutiso: When a shot is fired in the air, the bullet will eventually come back down and the only way to protect yourself is to put a hankie over your head. That one stuck with me since 2006. :D Just got "Going Down River Road", have you read it? Thanks k for stopping by. Yeah I have heard of "Going down River road" though I have not read it yet. Hopefully, I will soon.